Figure 1. 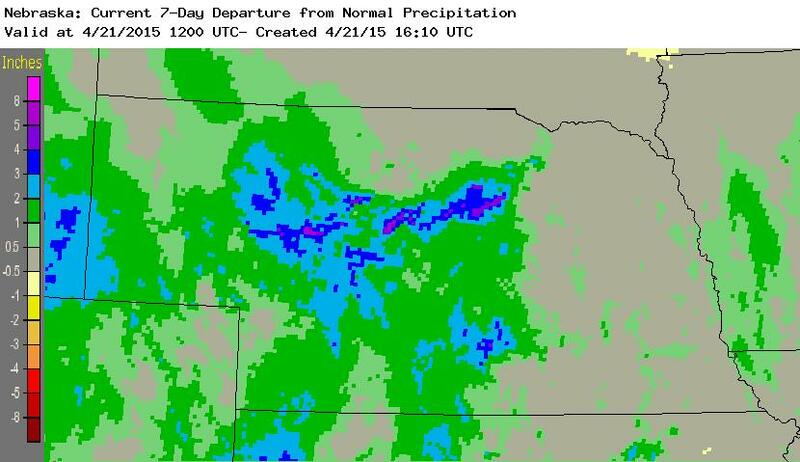 Seven-day departure from normal precipitation, as of April 21, 2015. As indicated, much of the central and western two-thirds of Nebraska exceeded normal levels. While Texas, Oklahoma, and Kansas saw the most severe weather from last week's storms, many areas of Nebraska saw storm precipitation totals over 2 inches, particularly in the western two-thirds of the state. Cooperative weather observation reports indicate widespread areas of 2-inch-plus totals across the Panhandle and the western half of the Sandhills. 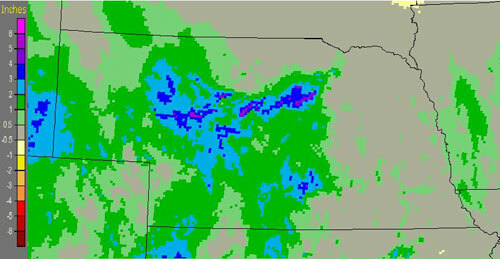 Smaller pockets were reported in the Kearney, Holdrege, and Imperial areas, with some reporting over 3 inches. In fact, the only widespread areas of the state not reporting at least 1 inch of moisture were in the eastern third. These heavier rainfall totals are causing planting delays in much of the state. Planting may be further delayed if areas of extreme southern and eastern Nebraska see precipitation forecast for late in the week, predicted to be up to ½ inch in some areas. A drier and warmer pattern appears to be favored for the western Corn Belt next week as high pressure builds behind the exiting low pressure system forecast for this weekend. Weather models indicate that another upper air low will swing into the region by month's end, bringing moderate to heavy rainfall to the central Plains. Models also indicate that no Arctic air intrusion will impact the state during this time and conditions should remain favorable for corn planting.